I posted a few times last winter about clearing the snow off the solar panels…or not. It seems like that particular dilemma is finally behind us, at least for the time being, but now we have to contend with a new challenge, dust! We haven’t had any rain for more than 2 weeks and there’s none in the forecast either. As the sun was coming up Friday morning I got up on the roof and cleaned the array (with a garden hose & squeegee.) But I left the layer of dust on the PV panel that would serve as the control subject of my experiment. As painful as it was to leave the dirty module alone, I did it for science. The next day I checked the production numbers and sure enough, the dusty module had a noticeable reduction. Here is the power chart for the 2 modules. Clean module in Green. Dirty module in Red. The energy totals for the day differed by 36.75 watt-hours (or 0.03675 kWh.) That doesn’t sound like much but remember, this is just one module out of an array of 38 modules. 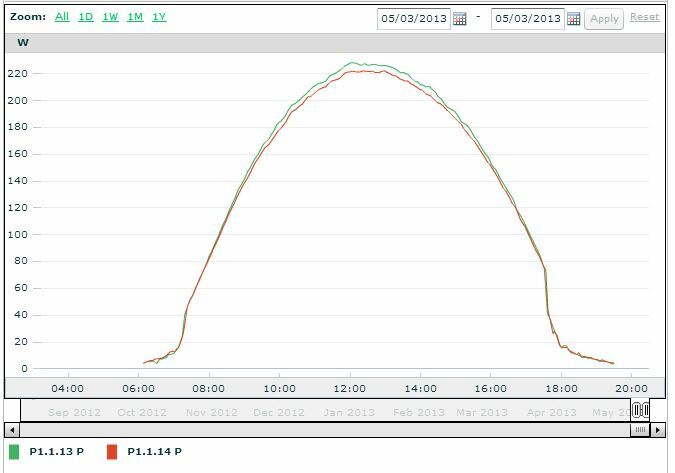 If we assume the effect is consistent across the array, the total result would be a loss of about 1.4kWh for the day. In dollars and cents, this still isn’t very significant ($0.28 worth of energy credit on our electric bill.) But consider this; 1.4 kilowatt-hours is roughly how much the refrigerator uses on a hot day in order to keep our veggies fresh and our ice cream frozen. How much is that worth to you?! The panels are already getting cruddy again just 24 hours latter. Pray for rain but pray it comes at night! 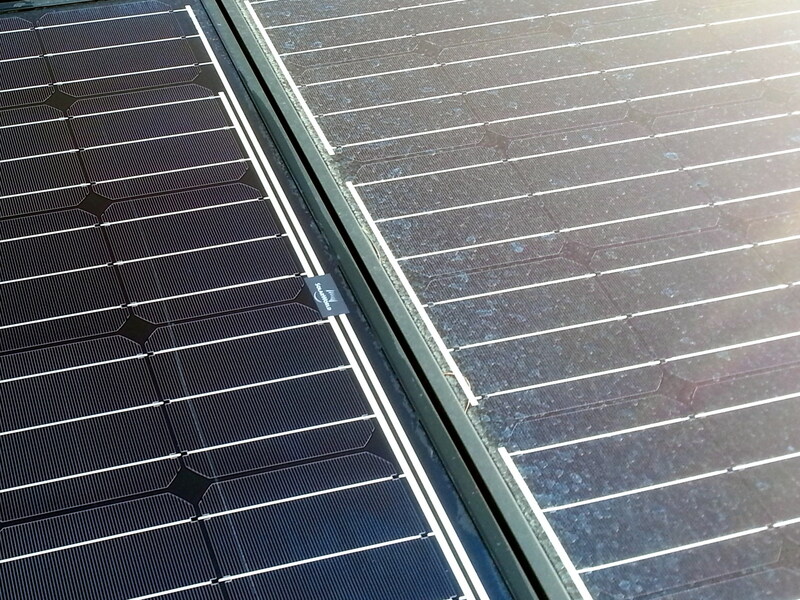 I wonder if the dip caused by you cleaning the panels takes away the benefit gained by cleaning the panels? Great question, Kevin! According to the monitor, the panels dropped about 90 watts for 10 or 20 minutes (the resolution isn’t very good.) So if we lost 100 watts for 20 minutes the change in energy was about 33 watt-hours, almost exactly what I gained by having a cleaner panel. So it was a wash (forgive the pun.) Thanks for pointing that out. Today I was careful not to shade the panels when I was up there hosing them down again! I love this blog!! Super useful science! Do you think the extra water usage is worth the extra energy gain? I figured that would come too. I don’t have a good answer. Unlimited fresh running water seems like a given here. But of course it is not. It is very energy- and chemically-intensive. I don’t doubt that we will soon be fighting wars over water supplies. Great, now I have to put in a rainwater catchment system too. Thanks a lot, Noah! My panels have been in operation only 2 weeks but I know that a lot of dust collects inside my house during that time, as I have to wipe off the desk where my computer sits. We don’t have rain in the SF Bay area for about 8-9 months each year. So I am thinking that I may have to clean them at least every 2 months. In deed! I care a lot more about the possibilities of engineering the weather now that I have a solar power system! My panels are in NJ. Other than the springtime, when the yellow pollen coats the panels everyday, we get rain every week or so. I have not needed to clean the panels. Anyone else in NJ on this site having problems with dirt on pitched panels? 2 things on the previous post and then I’ll quit. First I have noticed that water alone when sheeted across a panel will cause a noticable drop in power. So while you wash the power output will naturally be decreased. 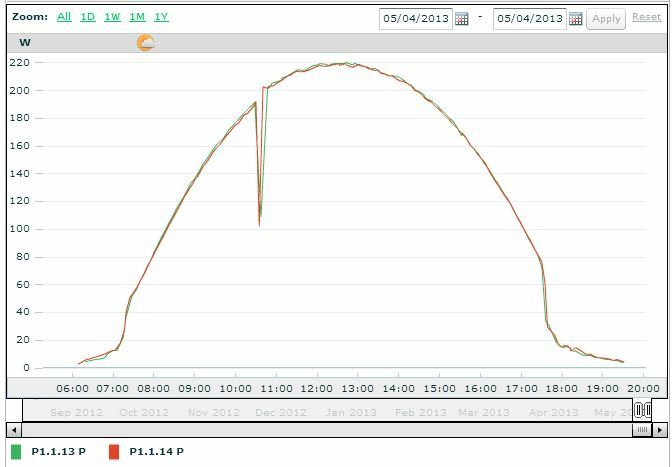 Second the periond might not have been 20 minutes for the power loss, as those are averages taken at points in time, you may have simply been unlucky enough to have one of the snapshots taken while cleaning.